Start Time is Subject to Change. 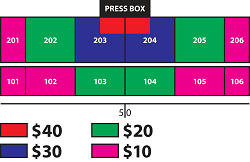 Tickets for the event range from $10 to $40*. Prices for this event will increase $10 when online sales end. Super Premium tickets include complimentary reserve parking near stadium, show program and cold beverage. Family Package - Children (10 and under) get a discount of $5 with the purchase of a full-price ticket (1 regular and 1 child ticket) when purchased in advance. Only available in the Super Sections. Accessible seating is located in Row O of sections 202, 203, 204, and 205. To purchase Accessible seating, please call the DCI office at 317-275-1212. - Row A is located at the top of the 200 level sections. Row P located at the top of the 100 level sections. Row X is closest to field in all sections. - For Sections 204 - 206 and 104 - 106, seat #1 would be closest to the 50-yard line. - For Sections 201 - 203 and 101 -103, the higher number seats are closer to the 50-yard line. Group Tickets**: Groups of 20 or more receive a discount at the Premium and Standard level. To inquire about discounts or to place a group order, please call 317-275-1212. The price of group tickets will increase $10 if buying after June 27th.